It’s 1967 and Nigel Slater is just nine years old. He and his mother stand over an island in the kitchen, preparing jam tarts. One day, Nigel is to become a household name in England – a chef and food writer renowned for his uncomplicated comfort food recipes and an engaging, memoir-like column in the Observer. 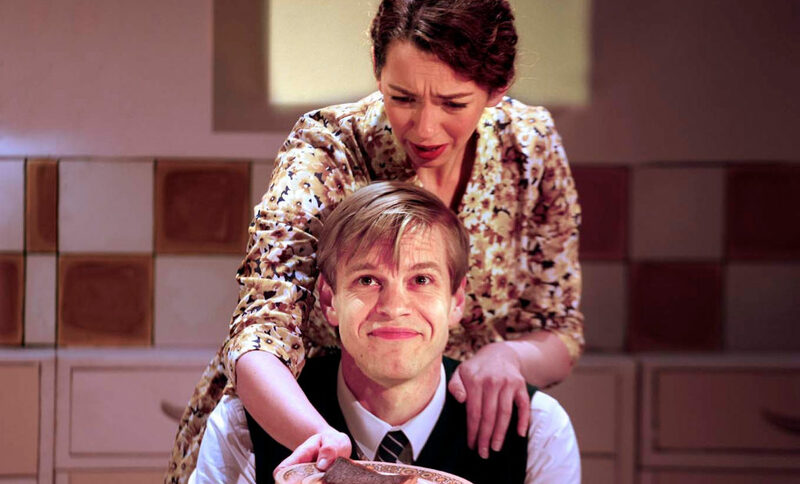 Toast is the story of Nigel’s genesis: a tale of a young boy’s love for his mum, and when she tragically passes, a transference of love into the art of cookery. The stage is beautifully understated. Designer Libby Watson has created a replica 1960s Wolverhampton kitchen. Ornamental cork-tiled floors and cardboard cupboards lend an air of childlike fantasy to this re-imagining of Slater’s youth. A red toaster sits playfully atop a pastel teal fridge that doubles as a door from which our cast emerges. Toast is a play that unselfconsciously tells a story. It owns its form and asks politely for a suspension of disbelief. Nigel (played by Giles Cooper) narrates, addressing the audience directly as the scenes revolve around him. Lizzie Muncey and Stephen Ventura are impeccable as the boy’s parents. One of the opening sequences shows the heartwrenchingly middle-class family attempting to innovate in the kitchen with spaghetti Bolognese (daringly continental) – they simmer the pasta for 25 minutes till it looks like “yellow worms”. Moments like this evoke endearing nostalgia. Toast is a coming-of-age story, but it’s also an exploration of how one remembers and re-imagines their childhood – a succession of scenes imbued with the intrinsic emotionality of memory. Jonnie Riordan’s direction and choreography buzzes with energy and is quite simply unforgettable, while writer Henry Filloux-Bennett has successfully pulled off the challenging feat of re-envisioning Toast (already in book and film form) in a new way for the stage. Filloux-Bennett’s writing captures Nigel’s personality, always witty and at times downright poetic – “[the car] smelled of sick and strawberries and anger”. Whether audiences are familiar with Nigel Slater’s work or not, this play offers something scrumptious for everyone. Honestly, even food director James Thompson’s delectable treats – offered efficiently throughout the show – can be catered to theatregoers’ allergies. But unlike actual toast, this production comprises many ingredients; each one is of the finest quality, and the recipe is thoughtfully composed. The result? A truly memorable dish, one eminently deserving of mass consumption. 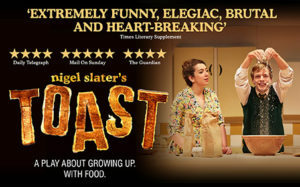 Toast is at the Other Palace from 4th April until 3rd August 2019 and then tours the UK. For further information or to book visit the theatre’s website here. Read our interview with the show’s star Giles Cooper.